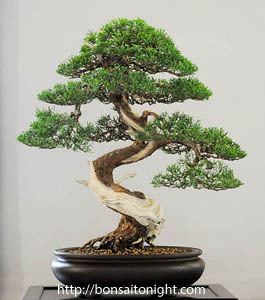 This page will feature a growing collection of bonsai plant material description and infomation on care and culture. agricultural zones seven and eight. of flower forms and color patterns with multiple patterns often appearing on a single plant. on a lighter background. 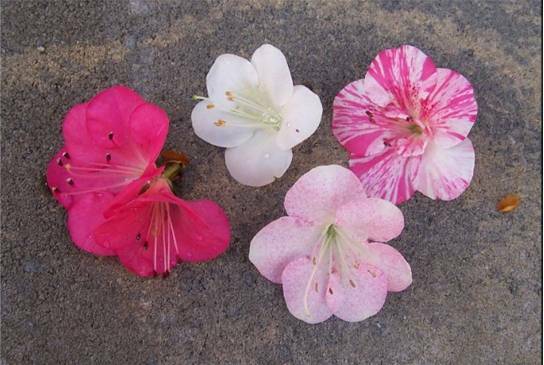 The complete range of color patterns can appear on the same plant, differently each year. care they can grow quite fast. winter every year. 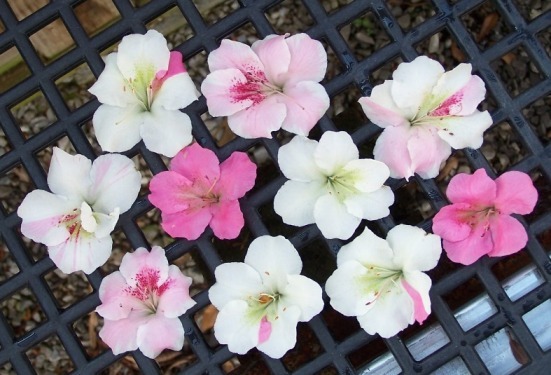 Each flower bud sends a signal to the plant to keep feeding that branch and keep it alive. 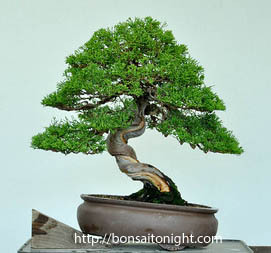 bonsai. 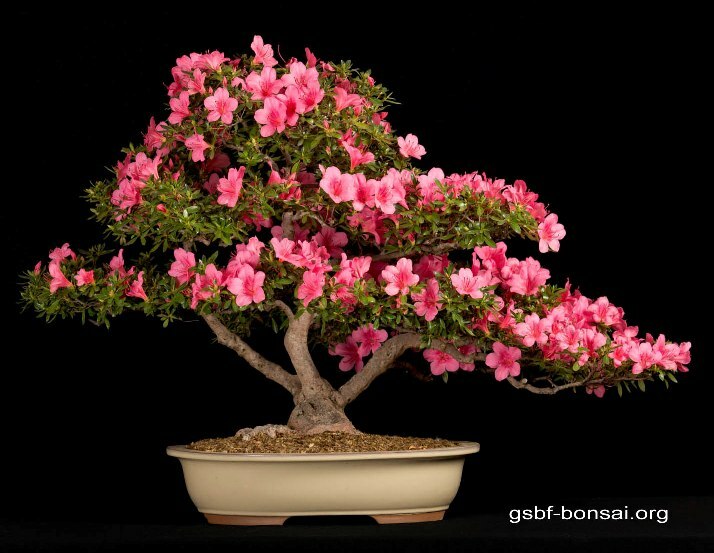 Remove branches at or near the top if the flowers bloom red or dark pink. for the flowers to drop. Light: Satsukis prefer partial to almost full shade. 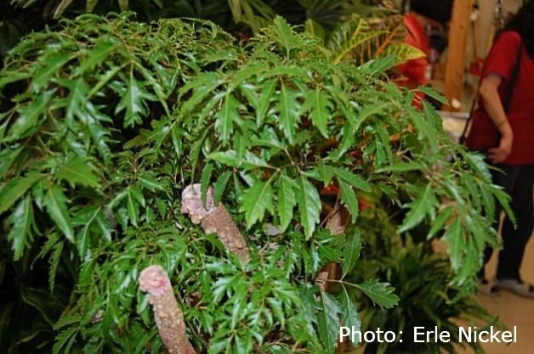 They are understory bushes or shrubs. older leaves will yellow and fall. Azaleas are evergreen, but no leaf lasts forever. then once or twice with a low Nitrogen fertilizer in October or early November. Feed more often if the soil is inorganic. Hold off on feeding until one month after repotting. of water) during the fourth week. Foliar feeding is best in the morning when the stomata are open. Do not foliar feed after the temperature reaches 70 degrees. echoes the trunk movement, i.e., curves that diminish and get tighter toward the ends of the branches. Secondary branches should start out paralleling the primary branch, then move outward away from it. more likely to sprout new growth from the bottom. Do major styling immediately after blooming has finished. A new growth spurt is about to happen. foliage on a branch will be the death of that branch, as well as a line on the trunk down to the roots. If you wish to encourage significant back-budding and ramification, you can perform moto bedome. 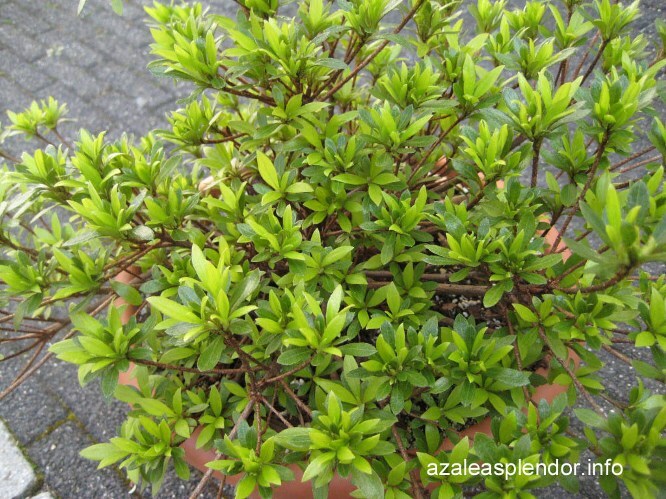 This is done by cutting all flower buds and leaves, leaving just about 1/8” to 3/16” of green on each bud and leaf. flowers AND the seed pods to conserve the strength of the tree. Flowering is subjected to the three year schedule. Potting: Repot every 3 years for young trees or every 3 to 5 years for trees over 10 years old. Summers that can begin in late May. A glazed pot that is not too shallow is preferred. When repotting, use a sharp knife or scissors to make clean, straight cuts across the bottom and sides. 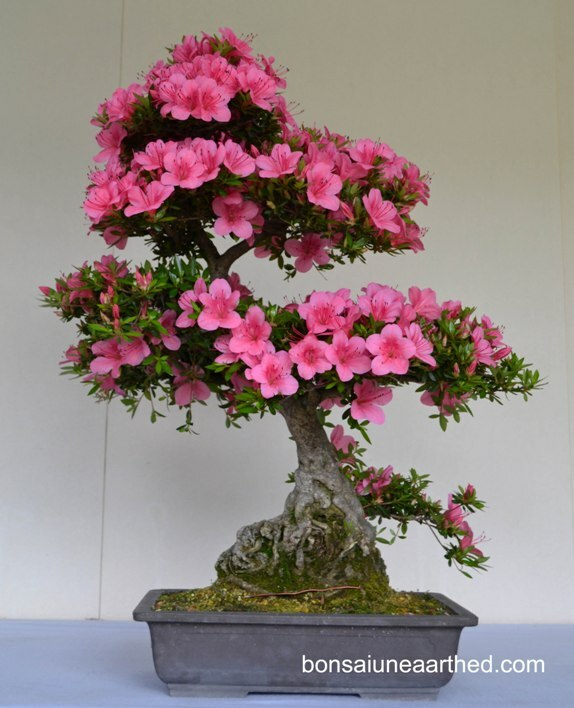 get rid of the old peat/pine bark soil mix, but otherwise don't disturb the root mass of an azalea bonsai. Exposed roots left hanging out of the root ball will be pressed against the side of the root ball and may well die. hard material in the soil. repotted azaleas right back in full sun. Keep them in light shade or at most part sun for the first month after repotting. 3% Hydrogen Peroxide in a 40 to 50 oz. Spray bottle at least every other week during the Spring. 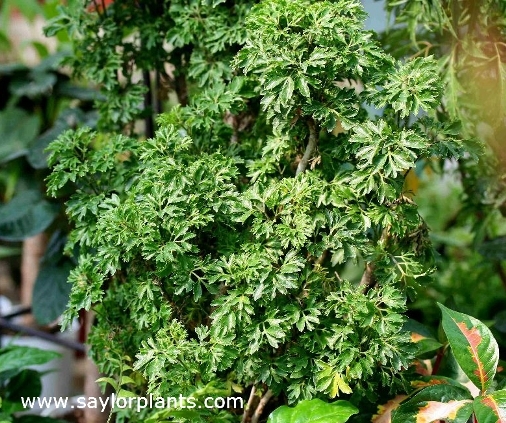 Ming Aralia is a perennial evergreen, seen in the form of a shrub or dwarf tree, native to India. or ginseng, family - also includes a number of popular house plants such as English Ivy, as well as the herb Ginseng. are deeply lobed. The leaves are also highly variable, sometimes on the same plant, and are frequently variegated. 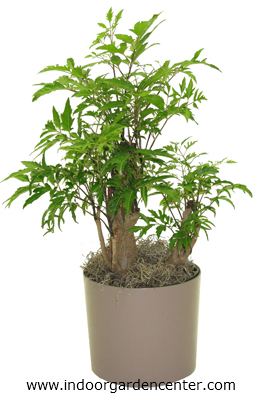 The Plumata variety of Ming Aralia is a feathery form with small leaves, and is excellent for bonsai culture. exposure to direct sun should be done very gradually, and should be limited to morning sun only. 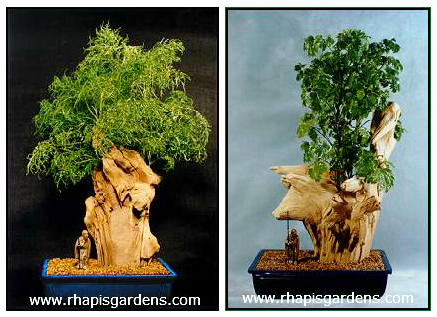 Hardiness: Ming Aralia thrives in warmth, preferring a temperature range between 60 and 85 degrees Fahrenheit. As described, it may be grown outdoors during the warm months. in warm weather, your plant will usually require daily watering. deficiency, it is not general practice to fertilize during the coldest and shortest days of the year. plant near a window, rotate it periodically to expose all areas to the outdoor light. replacement growth, and avoid over-watering while the plant is recovering. see fungus gnats emerging from the area. A rechargeable hand vacuum is excellent for keeping them under control. arranged in four ranks and overlapping flat on the twigs like fish scales. The bark is brown and shreds off in thin strips. Summer yields a darker green foliage. mulch to about one inch above the pot. Over the winter foliage may get a slight purplish tint. but not for an extended period. Water sparingly during winter months. Use a heavy spray on the foliage once per week to dislodge spider mites. Be careful to point the spray away from other plants. is inorganic. Hold off on feeding until one month after repotting. after the temperature reaches 80 degrees. contribute to the character of the branch. new growth throughout the early growing season. Wilt-Proof and mist the plant several times per day. Keep it in a mostly shaded area for a couple of weeks. Removal of all foliage on a branch will be the death of that branch down to the roots. 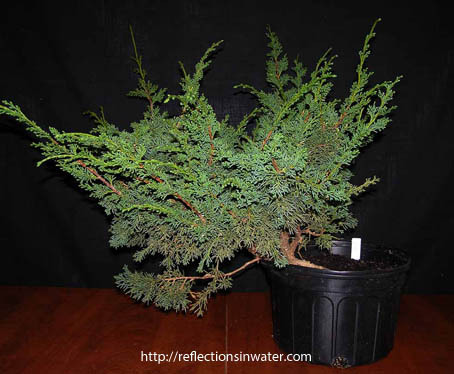 Junipers develop veins or water lines wherein some roots feed particular branches directly. the interior of the plant and encourages back-budding. Potting: Repot every 2 or 3 years for young trees (up to 10 years) or every 3 to 5 years for older trees. 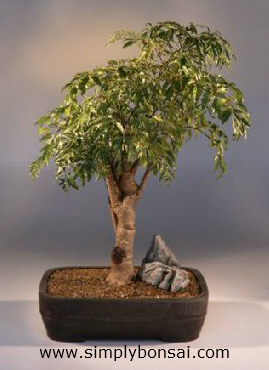 Repotting is typically done from mid winter through early spring. Repotting in April can be done but is less desirable. Keep styling minimal during the years when repotting. Shimpaku like a pot that is slightly deeper than normal. 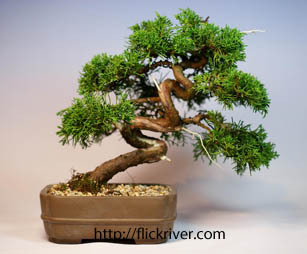 As with most conifers, an unglazed pot is usually preferred. and maximize pest spray contact. Spray with dormant oil in January or early February. 40 to 50 oz. spray bottle at least every other week.